The phone call to the World Bank Treasury came out of the blue: in late 2007, a group of Swedish pension funds wanted to invest in projects that help the climate, but they did not know how to find these projects. But they knew where to turn and called on the World Bank to help. Less than a year later, the World Bank issued the first green bond—and with it, created a new way to connect financing from investors to climate projects. Bonds are essentially an agreement where issuers borrow funds from investors and must repay investors at an agreed rate after a specified amount of time. Governments, companies and many others issue bonds to borrow money for projects. Issuing a bond was nothing new for the World Bank—it has been issuing bonds since 1947 to raise financing from the capital markets for its development projects. But the concept of a bond that is dedicated to a specific kind of project had not been tested before. 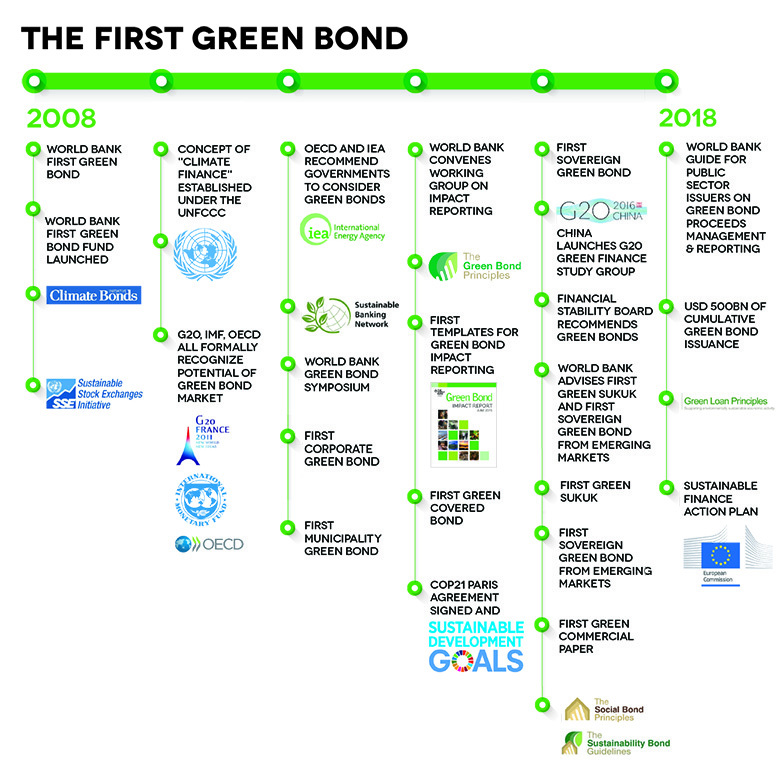 The green bond turned out to be a history-making event that fundamentally changed the way investors, development experts, policymakers, and scientists work together. In 2007, the Intergovernmental Panel for Climate Change—a United Nations agency that provides scientific data on climate change and its political and economic impacts—published a report that undeniably linked human action to global warming. The finding, along with increasing occurrences of natural disasters, prompted a group of Swedish pension funds to think about how they could use the savings they were stewarding toward a solution. They called on their bank, SEB (Sandinaviska Enskilda Banken AB) to see what could be done. And SEB connected the dots between the financing that was seeking to reduce risks for the investors and make a positive impact, and the World Bank with its deep knowledge on investing in environment projects around the world. In hindsight, the solution seems straightforward. Investors wanted a safe place to put their money and know that they were making a difference. The World Bank had environment projects to finance, a track record as a high-quality bond issuer, and the ability to report on the impact of its projects. But there was a missing link: how could investors be truly certain that the projects they were supporting addressed climate concerns? This triggered another phone call, this time to CICERO, the Centre for International Climate and Environmental Research— an interdisciplinary research center for climate research in Oslo. CICERO scientists were leading experts on climate issues. They could provide a credible view on whether a project was going to make a positive impact on the environment. What followed were many more conversations among the pension funds, SEB, CICERO, and the World Bank Treasury. The conversations were often difficult—especially since more often than not, the different organizations spoke different languages, and it was challenging to bridge the gap between finance, development and science. Success ultimately came in November 2008, when the World Bank issued the green bond. The bond created the blueprint for today’s green bond market. It defined the criteria for projects eligible for green bond support, included CICERO as a second opinion provider, and added impact reporting as an integral part of the process. It also piloted a new model of collaboration among investors, banks, development agencies and scientists. Ultimately, it was the result of their commitment, perseverance, and drive to find a solution. The World Bank green bond raised awareness for the challenges of climate change and demonstrated the potential for investors to support climate solutions through safe investments without giving up financial returns. It formed the basis for the Green Bond Principles coordinated by ICMA, the International Capital Markets Association. It highlighted the social value that bonds could create and the need for a sharper focus on transparency. Since then, the World Bank has raised more than US$13 billion through almost 150 green bonds in 20 currencies for institutional and retail investors all over the globe. At the end of the fiscal year 2018, there were 91 eligible projects and a total of US$15.4 billion in commitments. Of these commitments, US$8.5 billion in Green Bond proceeds were allocated and disbursed to support projects in 28 countries and another US$6.8 billion had yet to be disbursed. As of June 30,2018, Renewable Energy and Energy Efficiency and Clean Transportation projects represented the largest sectors in the Green Bond eligible project portfolio. Together, these sectors made up approximately 69 percent of the Green Bond commitments. The World Bank’s first Green Bond Impact Report is widely recognized by the market as a standard and model for impact reporting. Other green bond issuers now include companies and banks of all sizes and several countries. All issuers are measuring, tracking and reporting on the social and environmental impact of their investments. Fannie Mae is the largest issuer of green bonds by volume in a single year. Fiji last year issued the first emerging market sovereign green bond. Every bank active in the international capital markets has staff dedicated to green or sustainable bond financing. Green lending criteria are being incorporated in loans. There is an industry of second opinion providers and verifiers, including rating firms and others providing information to investors and supporting issuers. And the green bond concept has been expanded to other labels, such as social bond and blue bond. How do green bonds help tackle climate change? Green bonds raise awareness for the challenges of climate change and demonstrate the potential for institutional investors to support climate-smart investments through liquid instruments without giving up financial returns. They also highlight the social value of fixed income investments and need for a sharper focus on transparency. The first green bonds formed the basis for international green bond principles coordinated by the International Capital Markets Association. Green bonds have changed investor behaviors: ten years later, investors are publishing their names and providing quotes when they buy green or other labeled bonds and are much more aware of their power to support initiatives with their investments. Fast forward ten years. Capital markets have evolved from a market where investors knew and cared little about what their investments were supporting, to one where purpose matters more than ever. The basic green bond premise—with its model for project selection, second party opinion, and impact reporting—is being applied to other areas. As a result, there are now social bonds, blue bonds, and other bonds that raise financing dedicated to a specific development purpose. All follow the green bond model with its focus on impact reporting. More than US$500 billion in these kinds of labeled bonds have been issued since 2008. “Investors want a competitive investment, but we see that more investors also want to put their money to have a positive and measurable impact on society,” said Heike Reichelt, World Bank Treasury’s Head of Investor Relations and New Products. Investors’ interest in the social and environmental purpose of their investments reflects a fundamental shift in the bond market. Investors understand their power to support initiatives their stakeholders care about, that they do not have to give up returns. They also want data that shows how they are addressing environmental, social and governance factors—particularly as they and they increasingly understand that in addition to creating social value, they are mitigating risk to their own investments. An issuer with good sustainability practices will generally be a better investment. Issuers are responding. Issuers are engaging with investors to show how their bonds present opportunities to achieve both financial and social returns. Investors are looking beyond the narrow market of labeled bonds to understand how issuers use their investments. That market is much larger – the World Bank alone issues US$50 billion every year in Sustainable Development Bonds for its development lending. This revolution was sparked by green bonds. The bigger picture is to continue the revolution and momentum towards achieving the Sustainable Development Goals (SDGs) by 2030. The structure and reporting for bonds will continue to become more sophisticated, and one day every investor will ask “what’s my impact?” and expect clear and convincing data as the answer. There is a long way to go, but the imperative by climate change, urgency for action, the power of the capital markets, and the commitment by investors to do well by doing good will drive the development finance toward success. This entry was posted in WBG News & Reports and tagged Captial Markets, climate change, Green Bonds, Solutions, Wereldbank Groep, World Bank Group by NL4WorldBank. Bookmark the permalink.